Clay roofing systems have been used since times immemorial and a great number of historic buildings feature these roofs even today. The tiles on them have withstood the wear and tear for over a hundred years. This is how long your clay tile roof can last if it's made from premium-quality materials and installed by experienced professionals from Royal Roofing Inc.
Clay tile roofs are rather expensive and heavy. Therefore, in order to install this type of roofing, you will need to reinforce your roof trusses. 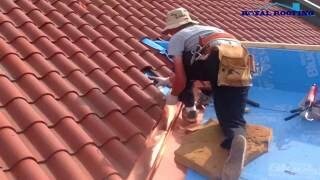 The benefits offered by clay tiles as well as the extremely long lifespan of this system explain the cost of the materials and prove that this roof is a worthy investment. An extremely high resistance to weather (snow and temperature changes in particular) makes clay tiles roofing one of the best options for Toronto residents. There can be no doubt that this system will handle the trial of harsh Toronto winters admirably. It's true that clay tiles can crack if damaged by debris, so they can suffer some measure of damage during hails. However, the cracked piece can be easily replaced. Overall, clay tile roofing doesn't require much maintenance and it's so durable, your repair expenses over the years will be minimal. Therefore, despite the large initial cost, this is a rather cost-efficient option. You can also find clay tiles for sale or use some old and reclaimed tiles to cut down on the total cost of this roofing system. Our specialists will help you find the most affordable solution so that you can enjoy having the roof of your dreams without exhausting your bank account. These are designed in pairs with one tile essentially hooking the other. These pieces aren't restricted to pairs and are installed by nailing them to the roof structure. Flat clay tile shingles may seem rather plain, but they look very smart and elegant. The most common variations are English, closed, and slab shingle as well as French clay roof tiles. The latter option has the most elaborate profile. The vast majority of historic clay roofs have variations of pantiles tiles. They include Barrel, Mission, Roman, Greek, and Spanish clay roof tiles. Each brand offers tiles in the traditional red as well as a variety of other colors. Our specialists will provide you with samples so that you can see how these tiles will look in different lighting. Concrete or Clay Roof Tiles? As far as roofing materials go, concrete tiles are rather close to clay in both characteristics and price. They are a bit lighter, cheaper, and a lot less durable. A clay tile roof will last over a century with proper maintenance, but concrete only comes with a 50-year warranty. All in all, a clay tile roof is a fabulous option for any home that can carry its weight. It will give the building a distinctive look that speaks of luxury and elegance. We at Royal Roofing Inc. will be happy to help you choose, install, and maintain the best clay tile roofing for your house.